What is Holding You Back from Surpassing Your Goals? Business. Legal. Life. Courtney Elizabeth Anderson, J.D., M.B.A., M.S., is "The Workplace Relationship Expert" ™ (CourtneyAnderson.com) and practices the "Joyful Art of Business! "™ around the world (media expert analysis including Businessweek, MSNBC, Wall Street Journal, FOX News, Cosmopolitan, CNN International, USA Today, CNN - HLN, Christian Science Monitor, HuffingtonPost, and many more..). 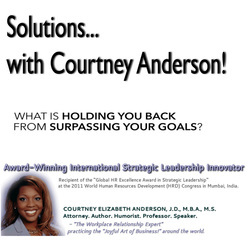 ”Solutions…with Courtney Anderson”™ is a daily show that delivers pragmatic concepts and tools that will permit you to “Practice the Joyful Art of Business”™ each day! An attorney (Litigation-Mitigation.com is law firm site), Ms. Anderson specializes in serving empowered individuals and entrepreneurs with high caliber, technology based, legal solutions. This is the series SELF-EMPLOYMENT ECSTASY™! I am ecstatic about this series as self-employment has been one of the most enjoyable aspects of my professional life. I aspired to be self-employed from the time I was a child. I shared some of my family role models in prior shows (ancestors that were real estate investors, entrepreneurs, self-employed attorneys, etc.). I love the art of creating something from nothing whether it is a short story, a lawn mowing business, a global billion dollar firm or a single person service. It is all fascinating! All of this is in furtherance of our mission to surpass our goals! What is holding you back from surpassing your goals?